This is Yeller (yellow) Head. He's a mature male and gets his name from his yellow head. 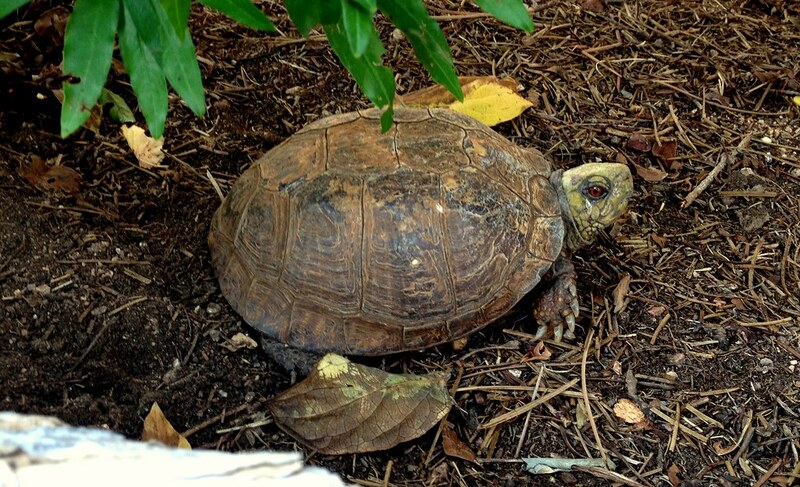 He was living in my back yard when I bought my property but he's a very shy and secretive turtle so I had no idea he was back there until the 3rd year I owned my house. There was another pair of turtles a male and a female that were very visible that lived back there. The other male looked to be Yeller Heads brother. I gave his brother to my brother and he now resides in CA. His brother was a very dominant male and that probably explains why Yeller Head is so shy and passive. As you can see he has little to no markings on his brown shell. He tends to hang out in one corner of the pen but many times he hangs out with the other females. I have one other male that is much more aggressive so the females tend to shy away from him. I often see the other male attempting to mount the females but usually with alot of resistance. Yeller Head is much more successful with the females and you never see him being aggressive with the females. They seem to submit to him without a lot of resistance.